The Skipton hotels listed below are either in the town or we have given a rough guide as to how far they are from Skipton. We hope you enjoy your stay and find your ideal accommodation. The Travelodge is situated at the junction of A65 and A59 and provides easy access to Bradford, Leeds, Harrogate and the Lake District. Local attractions include Skipton Castle, Haworth Steam Railway and Saltaire. This non-smoking Travelodge offers contemporary quality accommodation with spacious en suite rooms, each featuring a television and tea and coffee making facilities, making Travelodge great value. Station: SKIPTON. 1mile. This hotel is located at the junction of the A65 and A59.Please note: check in is from 3pm onwards. Station: SKIPTON. 1.5miles. From M1: exit Junction 46 at Leeds and follow A65 via Ilkley to Skipton town centre. Take A629 signposted Keighley/Bradford. Hotel is 1 mile on the left. From M62: exit Junction 26 onto M606. Follow signs A629 to Skipton. Hotel is on the right 1 mile before Skipton. Herriots Hotel in Skipton is situated at the gateway to the Yorkshire Dales and just 100m from Skipton Railway Station. Traditional food and quality cask ales are on the menu. In 1400 acres of beautiful parkland, Coniston Hotel is on the edge of the Yorkshire Dales. With free Wi-Fi and scenic views, it offers a shooting ground, falconry centre, 4x4 driving experience, and fly-fishing. 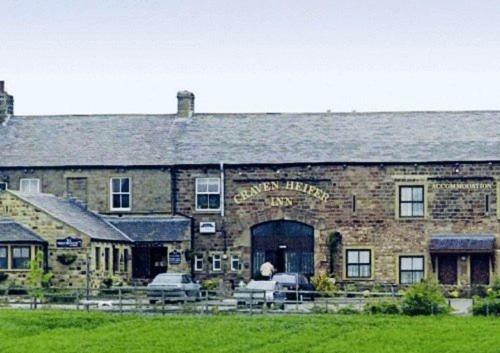 Situated in Skipton, at the gateway to the Yorkshire Dales, Craven Heifer Inn features a traditional restaurant and ale bar. There is free parking, free Wi-Fi and a large garden. This 5-star guest house is set in a 19th-century house within lovely flower-filled gardens in Skipton. It offers luxurious rooms with HD TV/DVD players and beautiful antique furniture. On the outskirts of Skipton, in the beautiful Yorkshire Dales, this charming, family-run hotel boasts a wonderful canal-side restaurant, great leisure facilities and idyllic views of the Leeds and Liverpool canal. On the gateway to the beautiful Yorkshire Dales National Park, The Plough offers well-equipped accommodation with free Wi-Fi and free parking. The hotel has a restaurant and a bar. 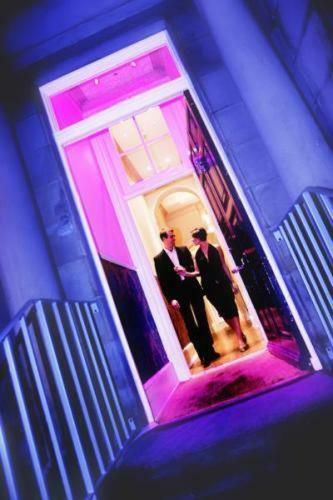 Skipton's first modern boutique hotel, this 18th-century building has been fully refurbished to provide individually designed guest rooms, a champagne and wine bar, a private dining room and a delicatessen. In Kettlewell, in the heart of the naturally beautiful Yorkshire Dales, this cosy traditional cottage is now a 4-star guest house offering warm, friendly Yorkshire hospitality. This converted railway station offers comfortable rooms and a large full English breakfast. It is set in a large garden by the Yorkshire Dales. The 19th-century Tudor House has a relaxing, sunny room overlooking the railway line. Hotel near Skipton. For more than 200 years "The Heifer" has catered for the needs of the traveller. For hotels accommodation in other areas nearby see Bingley hotels & Keighley hotels.